Who invented the Typewriter? The name of the person credited with inventing the Typewriter is Christopher Latham Sholes (1819 - 1890). Christopher Latham Sholes is not only famous as the American inventor of the Typewriter but also as a printer, entrepreneur and businessman. Sholes also developed the QWERTY keyboard that is still in use today. When was the Typewriter invented? Christopher Latham Sholes invented the Typewriter in 1867, during the Second US Industrial Revolution / Victorian period of invention (1850 - 1914). Definition of the Typewriter: The Typewriter is defined as a hand-operated, writing machine that produces alpha and numeric characters in the form of text on paper when the operator presses levered keys on a keyboard that strike a ribbon to transfer ink or carbon impressions of the characters onto the paper. Fact 1: Who invented the Typewriter? The Typewriter was invented by Christopher Latham Sholes in 1867 during the Second US Industrial Revolution era of inventions (1850 - 1914). Fact 2: Who invented the Typewriter? As soon as writing and the many different forms of paper were invented inventors needed to find instruments for writing. Prior to the invention of the typewriter authors had to produce their work or books on hand written documents. Fact 3: Who invented the Typewriter? Writing instruments: The Egyptians used reed brushes or reed pens (c. 4000 BC), the Mesopotamians invented the Stylus (c. 2900 BC), the Ancient Romans used a metal or bone stylus (c. 1300 BC) and the Europeans invented the quill pen (c. 600 AD). Pencil lead was invented in the 1790's and a a metal pen point came into common use in the 1830s. When the typewriter was invented the first proper fountain pen and the ball point pen hadn't been considered. Fact 4: Who invented the Typewriter? Prior to the invention of the Typewriter in 1867, the concept of a "writing machine" had been considered for many years. In 1714 Englishman Henry Mill (c. 1683–1771) patented "an artificial machine or method for the impressing or transcribing of letters singly or progressively one after another." However, nothing further is known about this machine. 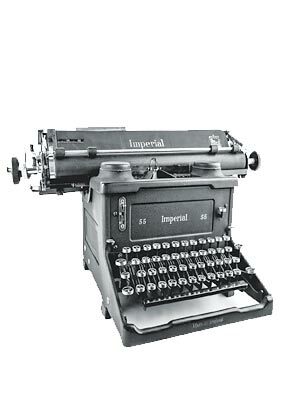 Fact 6: Who invented the Typewriter? The inventor credited with the proven invention of the Typewriter in 1867 is Christopher Latham Sholes. Christopher Latham Sholes was born on February 14, 1819 in Mooresburg, Pennsylvania, United States and died on February 17, 1890. Fact 7: Who invented the Typewriter? The early years of Christopher Latham Sholes were spent in Mooresburg, Pennsylvania, United States where he was raised by his parents, Orrin Sholes and Catherine Sholes and lived with his four brothers. Fact 8: Who invented the Typewriter? Christopher Latham Sholes was educated at the Danville School and following his education his father apprenticed him as a printer. Fact 9: Who invented the Typewriter? At the age of eighteen in 1837 Christopher Latham Sholes moved to Green Bay in Wisconsin and began working for his elder brothers, Charles and Henry who became publishers of the newspaper ‘Wisconsin Democrat’. Fact 10: Who invented the Typewriter? Christopher Latham Sholes became an editor and from 1848 - 1849 he served on Wisconsin State Senate and was active in politics. Fact 11: Who invented the Typewriter? While he was working as an editor of a newspaper in Milwaukee, he unsuccessfully attempted to build a device for typesetting to overcome strike action by some of the printers. Fact 12: Who invented the Typewriter? Although his first attempt to build a Typewriter was unsuccessful he was convinced that he could do it and continued to work on his idea. Fact 13: Who invented the Typewriter? Christopher Latham Sholes began working with another printer Samuel W. Soule (January 25, 1830 – July 12, 1875) and the inventors succeeded in creating a numbering machine which they patented on November 13, 1866. Fact 14: Who invented the Typewriter? Sholes and Soule showed their invention to another amateur inventor called Carlos Glidden who was so interested in the idea of a 'writing machine' that he agreed to join the pair and provide financial backing for the project. Fact 15: Who invented the Typewriter? Christopher Sholes was motivated by a short entry in the 'Scientific American' describing the "Pterotype", a highly complex prototype typewriter that had been invented by John Pratt. The 'Scientific American' referred to the machine as a typewriting machine, or typewriter and also used the used the phrase "literary piano" which further inspired Sholes. Fact 16: Who invented the Typewriter? Christopher Sholes discussed the article and his ideas for the invention of the Typewriter and the three inventors set about making a keyboard. With the idea of a "literary piano" the trio created a keyboard with two rows of black and white keys with the first row made of ivory and the second of ebony. Fact 17: Who invented the Typewriter? They developed a prototype typewriter with a full alphabet, numbers, and punctuation symbols and were granted a patent for their clumsy, weighty machine, that could only type in capitals, on June 23, 1868. Fact 18: Who invented the Typewriter? The invention of the Typewriter was heavily criticized. Sholes and Glidden (Soule dropped out after the first attempts) produced more than thirty working typewriter models before they finally built the machine that the Remington & Son arms factory put into production in 1874. Fact 19: Who invented the Typewriter? An important change to their invention of the Typewriter was the keyboard. When the typewriter was first invented the keys were arranged in an alphabetical order, but people typed so fast that the mechanical character arms got tangled up. Fact 20: Who invented the Typewriter? In 1868 Christopher Sholes, responding to reports of keys jamming on his prototype mechanical typewriters, separated the most commonly used letter combinations to slow typists down and try to avoid this problem. Sholes had invented the QWERTY keyboard. Fact 21: Who invented the Typewriter? The invention of the Typewriter attracted the interest of the Remington & Son factory and in 1873 Christopher Sholes sold his patent rights for the typewriter to the company for $12,000. Remington & Son put the typewriter into production in 1874. Fact 22: Who invented the Typewriter? Christopher Latham Sholes died from tuberculosis on February 17, 1890. He will always be remembered for his invention of the Typewriter.